In previous articles I’ve covered using MVVMLight in Universal Windows Apps and using C# partial classes and methods to implement different code on Windows Phone and Windows Store apps. While partial classes/methods are a quick win to alter small amounts of code for each platform, overuse might become painful as the solution gets bigger. There are also limitations of partial methods such as they can only return void, they are implicitly private, cannot be virtual, etc. 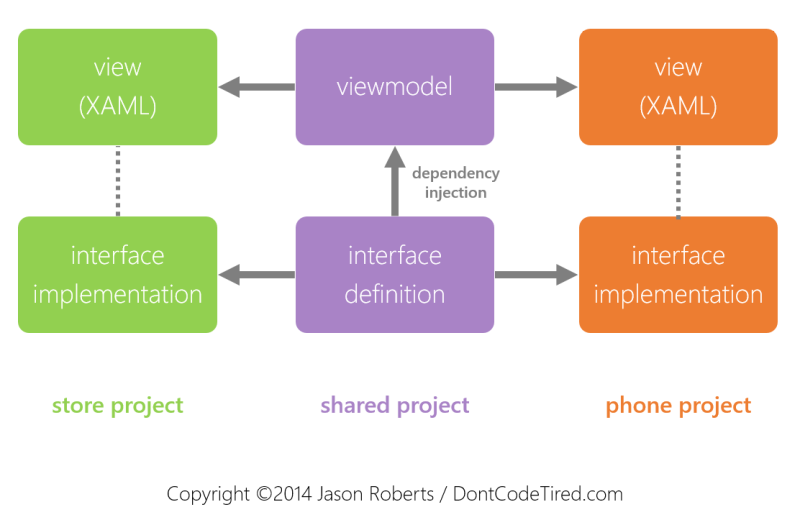 If we’re using MVVMLight (or another framework or hand-rolled viewmodels) we can use dependency injection. The viewmodel class is still shared between the two apps and doesn’t need to have partial methods which means we have more flexibility in the code we write. As a dependency in the constructor, the viewmodel takes an instance of a class that implements an interface. This interface-implementing class can then be two different classes, one in the phone project and one in the store project. The key thing here is the constructor: it takes an IGreetingService. When the SayHi command is executed, whichever instance of an IGreetingService was passed to the viewmodel, it’s GenerateGreeting() method will be called. It is in these specific implementations of the interface that the platform specific code is written. In these code fragments a new MainViewModel is being created and supplied with a platform-specific IGreetingService implementation. So in this way the shared MainViewModel class can still contain the majority of the code so we only have to write it once. But we still get the ability to write platform-specific code. I though it would be interesting to see how easy it is to define an MVVM Light view model once and then use it in both a Universal Windows Phone and Windows Store project. 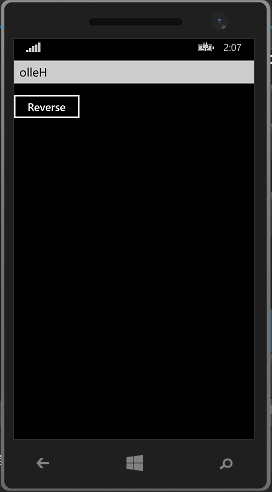 So I created a new blank universal apps project and added the “MVVM Light libraries only (PCL) NuGet” package to both the Windows 8.1 project and the Windows Phone 8.1 project. Now running either the phone or store app works as expected, the view model binding works as expected and clicking the button reverses the string as expected. Whilst this is not surprising, the view model in the shared project is just like having a copy of it in both app projects, even so it’s still cool. If we wanted to we could then leverage C# partial classes and methods to define platform-specific viewmodel code. Although code snippets can make creating our initial viewmodels easier (properties, commands,etc.) it’s still tantamount to boilerplate code. Obviously the actions that happen when a command is executed is not boilerplate, but the actual definition is. T4 templates are built into Visual Studio and allow us to define templates that are a mix of literal output (such as HTML tags) and C# code. We can for example create a C# for loop around some literal output, e.g. “Hello World” to output it 10 times. For more info on T4, check out MSDN. Rather than hand-coding viewmodels, we can define a T4 template. In this template we are able to define the view models we want generating – included both commands and properties that we want to have on those view models. The implementation in this article creates a new abstract base class for each view model that contains our commands and properties, in addition to a command init method to create and wire-up new MVVM Light RelayCommands along with can execute hooks. Once T4 has generated these base class view models, we inherit from them and a constructor that calls the base class’s InitCommands method. Note it derives from MainViewModelBase which is the generated code. Also note there’s no Person property (called “Who”) and no RelayCommand defined. We’ve overridden a couple of methods from the base class to get the behaviour we want and also called InitCommands in the constructor. To create new viewmodels we just add new ViewModelDefinitions and specify what properties and commands we want – currently property types are specified as strings rather than actual types. To get started and see it in action, download the sample application from GitHub and see how it fits together. The full template is here as well. While the examples here relate to MVVM Light, the concept could be used with other frameworks. When working with an MVVM Light sometime we need to “tell” the view that a command’s ability to be executed has changed. For example, when a user clicks a Start button to start a countdown, the Start button should be disabled and the pause button should then be enabled. If we’re binding a button to an MVVM Light RelayCommand, the button will automatically disable when then RelayCommand’s CanExecute function returns false. For this to work, when the user clicks Start, the command will execute, but then we need to tell the Start and Pause commands to raise their CanExecuteChanged events. To do this we can call the RaiseCanExecuteChanged method on each RelayCommand that logically makes sense for our application. Now when this IsPlaying property changes, the Pause and Start buttons commands can execute will be updated. A problem with this approach is that the logic to decide which RelayCommands CanExecuteChanged event gets raised in response to which properties are changing is distributed through all the property setters in the ViewModel. This can make it hard to reason about the changes in state of the ViewModel. One alternative approach is to centralise this logic in a single method. In MVVM Light, when we derive our ViewModel from ViewModelBase, we inherit a Cleanup() method. This method can be overridden, by default it will unregister all messages for the ViewModel, so calling Cleanup() on our view model will prevent multiple subscriptions occurring if we navigate back to the ViewModel and register it again. But where do we call Cleanup() ? One method is to get the View to call the ViewModel’s Cleanup() method when it is unloaded. We could write a codebehind “shim” to cast the View’s DataContext to our ViewModel type then call its Cleanup() method. Another method is to use the Behaviours SDK (XAML). Now every time the Page’s Unloaded event is raised, the Cleanup() method will be called on our ViewModel, which will unregister all messages for the bound ViewModel. The ViewModel must be Portable Class Library compatible and View agnostic, e.g. not need to know about dialog buttons, etc. One way to think about these design goals is that the ViewModel is asking for some semantic message/dialog to be displayed in the View. The way the ViewModel “tells” the View to create a dialog is by sending a message using the MVVM Light Messenger. This message allows us to define the commands that the view will call, based on the choice that the user makes in the dialog.